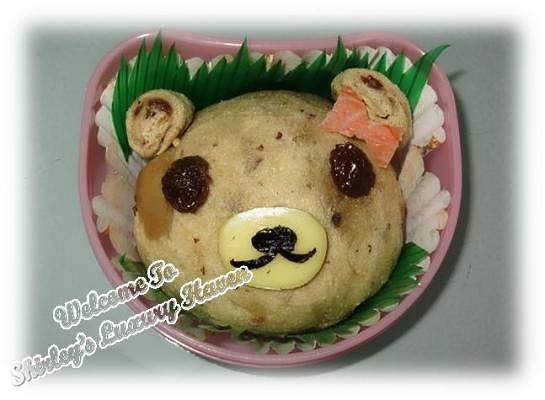 Mummies, make your way to your children's hearts by preparing this adorable teddy bear sandwich lunch box! You can also share great moments bonding with your kids through the bread-making sessions. Nothing is too difficult if you put your heart & soul into it. 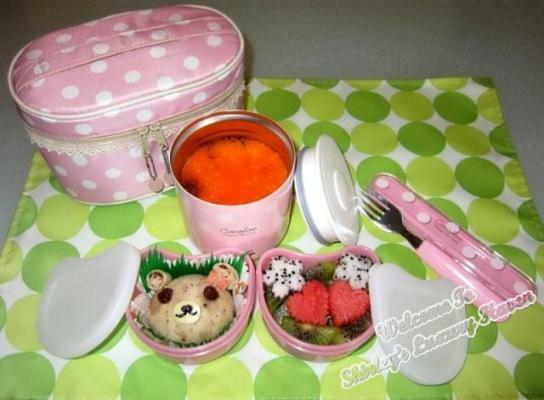 Sometime back, I posted Go Retro With CasaBento Pink Cocolon Bento Box Kit after receiving the cute pinky lunch box set & made the teddy bear together with fresh fruits, & also a Japanese Steamed Egg which drew a great response. Now, I'm gonna show you how I made this endearing teddy! Cut off sides from bread. Do not dispose edges. Keep for making the ears. Remove 2 raisins & set aside. Cut a piece of cling wrap on hand. Wrap bread into a ball. Press firmly to seal. Use water at the edges if necessary. Roll the edges you save earlier to make the ears. Insert small piece of noodle to hold the ear in place & stick it into the face. Start decorating the face by adding raisins for the eyes, seaweed & cheese for nose, crabstick for ribbon if you're making for a girl. Bingo! 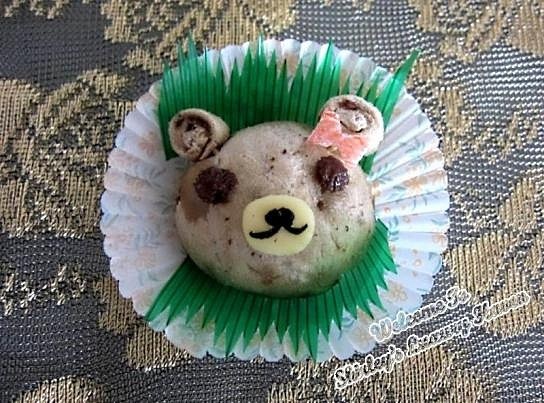 Here's your cute Teddy Bear Sandwich! 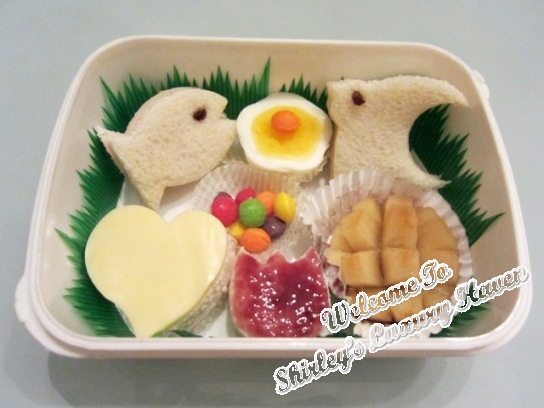 If teddy bear is not your cup of tea, here's more on Making Cute Bento Sandwiches! Hahaha..... this is so cute. I 1st thought it's some kind of brown rice, what a great disguise! DS, this is such an overdue post :< Thks for patience! CJ, I knew u're gonna like this! Hahaha! That's a very creative way of making a teddy bear, kids will want to have more!! Agnes, thks dear! Even the daddy wants to eat this. Lol! OMG.. My kids will flip if I make these. Thanks Shirley for the awesome post. Ash, have fun making! Have a wonderful weekend, my dear! Uru, thks dear! U're always so sweet! Oh my!!!! This is just too cute to eat! I don't think I would eat it, it is just too precious! Lizzy, thks for the sweet note! U have fun too! FoodieFC, I sometimes uses carrots too. U can use any type of ingredients u prefer. It's so versatile! Shirley, tuna on raisin bread sounds tasty! So, so cute and creative! This teddy lunch is adorable. Its so lovely...hmmm I normally won;t have the heart to eat it. Will just make it and gaze at it...someone else has to eat it for sure. 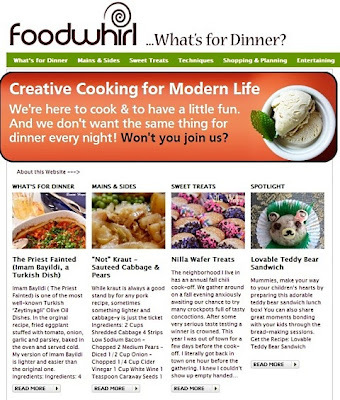 My friend tells me to go to this flauntmyfood.com website.. so i'm like... ok... but i'm glad i did because then i found this post on there! This is sooooo cute! I am making these for my kids today! Shirly, thks so much for your lovely note & it's great having u here! Do send me a pix if u do use this recipe & I'll post it to my Facebook Fan Page Readers' Corner! Valentines, thks for visiting & leaving your kind note! Have a good day!